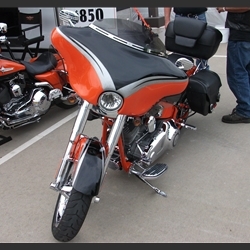 The Wide Open Harley-Davidson CVO Convertible fairing fits on the factory quick disconnect windshield brackets. And you must have the stock headlight, 5 3/4, for the fairing to fit your bike. May need to relocate turn signal.